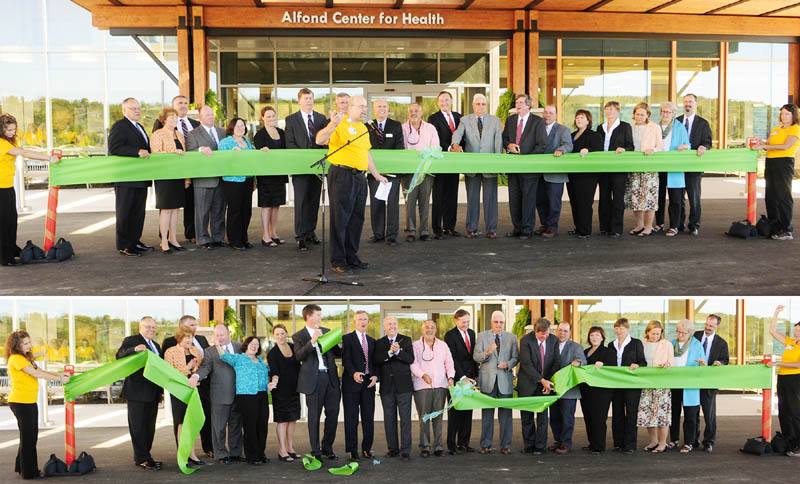 The Alfond Center for Health's open house on Saturday was greeted with "oohs," "ahhs" and "thank yous," as it was formally dedicated before a crowd of roughly 1,500, most of whom donated some of the more than $12 million raised privately to help build it. AUGUSTA — MaineGeneral Medical Center’s new $312 million Alfond Center for Health will be a place for life-changing moments, good and bad. Babies will be born and cared for there, including premature, low-weight and other newborns requiring advanced care that previously would have required a trip to Portland or Bangor. Lives will be saved by its new technologies and the doctors and other staff members with the skills to use it, including those lured to central Maine by the sparkling, new, state-of-the-art hospital, set to open Nov. 9, seven months ahead of the original schedule. Lives will be lost, too, and devastating diagnosis delivered to some patients at the medical center in north Augusta, meant to serve both the Augusta and Waterville areas. But even those patients will be better able to receive treatment, and die with dignity and privacy, more easily surrounded by their loved ones in a natural setting, officials said. Today, the new hospital’s halls were filled not with life-changing events, but “oohs,” “ahhs” and “thank yous,” as it was formally dedicated before a crowd of roughly 1,500, most of whom donated some of the more than $12 million raised privately to help build it. That’s not including the $35 million donated to the project by the Harold Alfond Foundation. Actually, make that $37 million. Greg Powell, president of the foundation, announced today it would make a “bonus payment” of $2 million, contingent on a successful move from the hospitals in Augusta and Waterville to the new one. Powell said the $2 million will be shared by MaineGeneral’s 2,200 employees, with $500 each for full-time workers and $250 for part-timers. 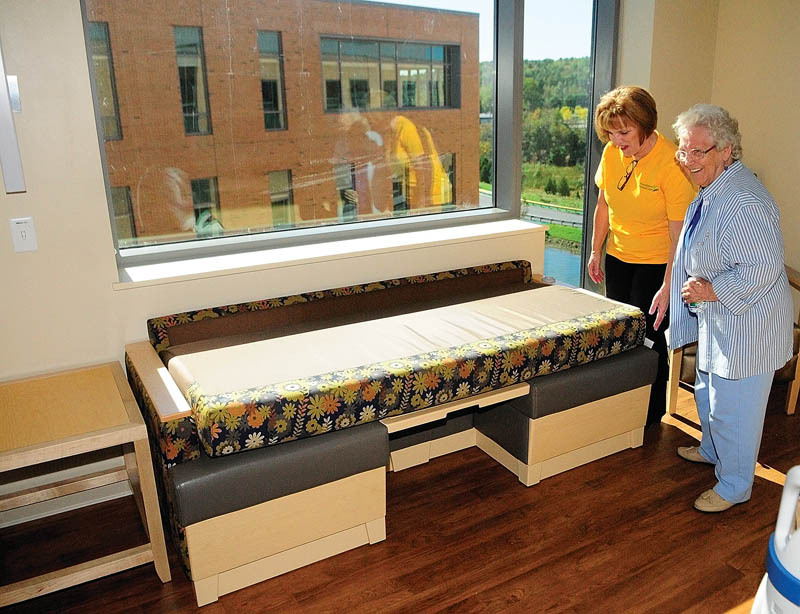 “Harold and Bibby Alfond envisioned, one day, the patients of central Maine would enjoy a setting (for medical care) surpassed only by the quality of its professionals,” a beaming Powell said. Powell said Harold Alfond, who knew he wouldn’t live long enough to see the hospital built, would think the building was awesome. Alfond died in November 2007. Powell said Alfond appreciated the business case for merging two hospitals 20 miles apart into a regional one, but also had emotional attachments to the hospital because, despite the financial means to get treatment anywhere in the world, he chose to be treated for prostate cancer at MaineGeneral. Visitors checking the hospital out today were impressed. Steve Diaz, chief medical officer, and Chuck Hays, CEO of MaineGeneral Health, said it already has drawn new doctors and specialists. Drawing doctors to the area during a time when nationally, they said, there are fewer entering the field, was one of the justifications for building the hospital. Diaz, who started as an intern at MaineGeneral 20 years ago, said the hospital will make it easier for health care providers to take care of patients and has generated a buzz in the medical field. “Even before we open, for the first time in a long time, we’re attracting the doctors we need,” he said. All patient rooms at the 192-bed, four-level hospital are single-occupancy, providing privacy and reducing the risk of infection. The rooms include sofas that fold out, allowing family members to sleep in the rooms. Further boosting privacy, patients being moved between rooms can be moved around in a corridor separate from the main corridor used by visitors. The hospital was designed with a nature theme. 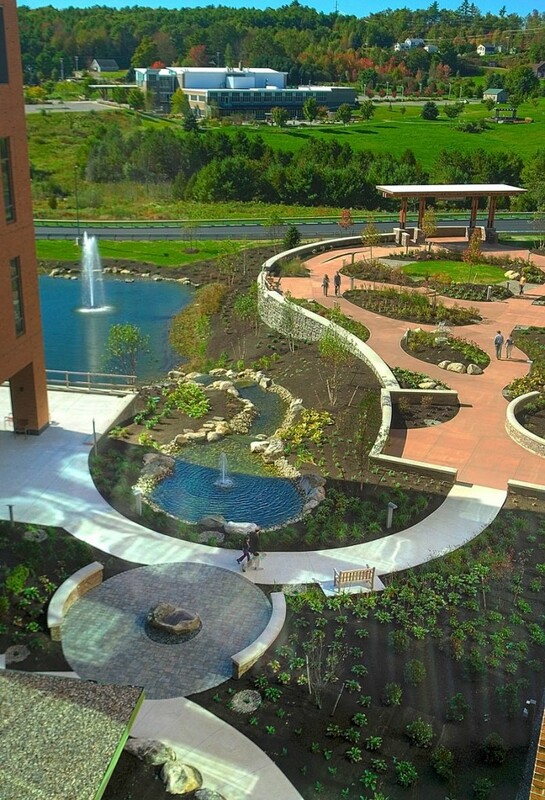 Large sections of glass allow natural light in, and there is an expansive healing and therapy garden with fountains, plantings and paths built into the grounds, located in the rural, wooded outskirts of the capital city. Hays said studies show the more patients are exposed to nature and light, the quicker they heal. “As beautiful as this new hospital is, the most important thing about it is what it allows us to do for patients and families,” said Sherri Woodward, chief nursing executive and senior vice president of patient services. John Scott, project manager of the construction project, said some 3,200 worked on the construction site, and more than 5,000 Mainers contributed to the project through construction, planning and off-site work. The 640,000 square-foot hospital took two years to complete and was finished seven months early. 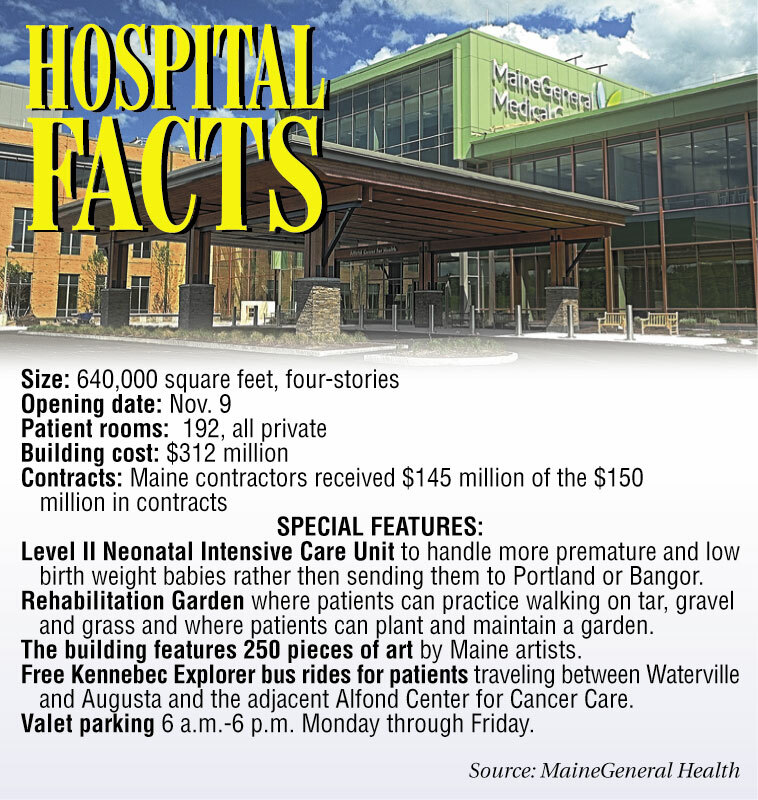 Nearly 90 percent of the work was done by Maine workers, according to Diane Peterson, spokeswoman for MaineGeneral. The hospital, on Old Belgrade Road, has also prompted reconstruction of exit 113 of Interstate 95 to make access easier and spurred a property listings boom in that section of the city. The second phase of the overall $322 million project is a $10 million renovation of MaineGeneral’s Thayer Campus in Waterville, where construction will start later this year. Once completed, Hays said Thayer Center for Health will be the state’s largest outpatient center and will keep its 24-hour, seven-days-a-week emergency department. The public may tour the hospital from 1 to 4 p.m. Sunday.